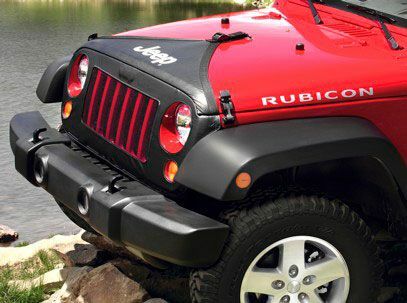 Protect the hood of your Jeep Wrangler from road debris, dirt and insects with a hood cover. This hood cover is made of vinyl with a 22-ounce polyester backing that protects your paint. It's made by Mopar, so you know it will fit right. The hood cover comes in two colors, black or khaki, and features the Jeep logo. It does not interfere with opening the hood and it can be removed in minutes. Grill covers are sold separately. Arrived fast simple to install, last two were stolen at Jeep Dealer. Now I remove every service event. After installing the hood protector I had a 4 hr drive (1 way). Of course I didnt take the hood cover off until I got home several days later & the 4 hr drive home. I took the protector off when I got home & noticed the hood had 2 small dents in it where the hard plastic holder thingy, when it flapped in the wind made these two dents in my hood. Needless to say I took it off & its staying off! ProsKept the bugs off hood.